In Southern Nevada, one out of five children does not know where their next meal is coming from. One in five. September is an important month at Three Square Food Bank. It’s Hunger Action Month, and they’re off to a good start. The entire community can join together this month to help fight hunger by filling one empty plate at a time. Whether it’s by making a generous donation, volunteering or attending events, you can find a way that’s right for you to make a difference this month! 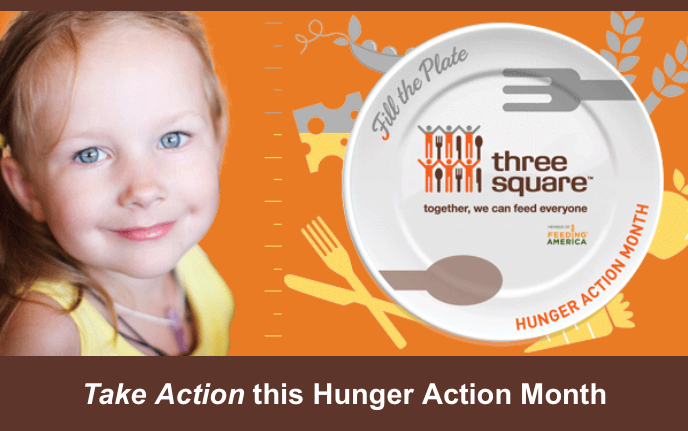 With your help, Three Square serves more than 164,000 unique individuals each and every month. Host a traditional food drive, have our team create a personalized virtual food drive page to kick off a friendly competition in the workplace or amongst friends, or contribute to Three Square’s community-wide Fill the Plate virtual food drive. Learn more. Help them distribute meals by sorting and repackaging food at their warehouse, filling backpacks with weekend food for kids or helping out at special events this month. See our volunteer opportunities. Join them for events like our Fill the Plate Radiothon or Orangetheory’s Fitness Night, a community celebration hosted by KOMP 92.3 and Lotus Broadcasting. Find out how you can get involved.